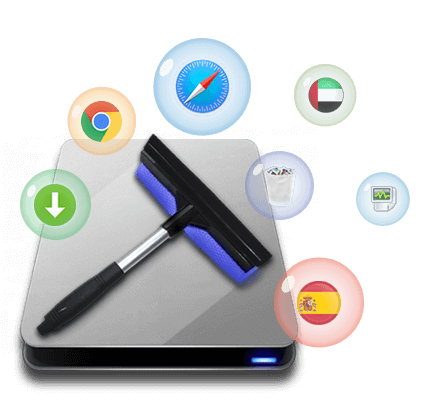 Free up Space on Mac Hard Drive by clearing cache, downloads and trash files with just one click. The application scans your computer for all junk files and helps you to get rid of them easily. 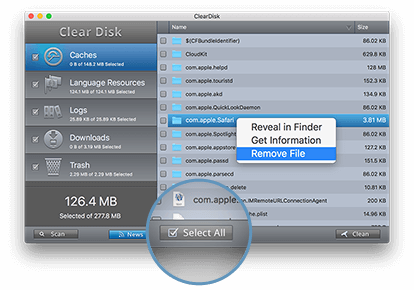 ClearDisk app allows you to clear the HD of useless files. It removes unnecessary downloads and old caches, and even clears the Trash. You can clean your Mac with a single click: all junk files (System Caches, User Caches, System Logs, User Logs, User Downloads, Trash, Internet Cache, etc.) will be removed immediately. 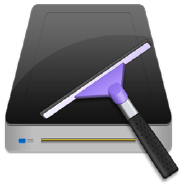 Find and remove unnecessary files which take up useless space on your disk. Get rid of Cached data, Downloads and the Trash content with a few clicks. Select what type of files you want to find and click the Scan button. In a few seconds you will get a list of junk files and folders. Review the items cluttering your disk space and select the ones for removal. Just mark the checkboxes next to each file/folder or make one click on the Select All button to get rid of all of them. One click on the Clean button, and all your useless files will be removed from your Mac hard drive. 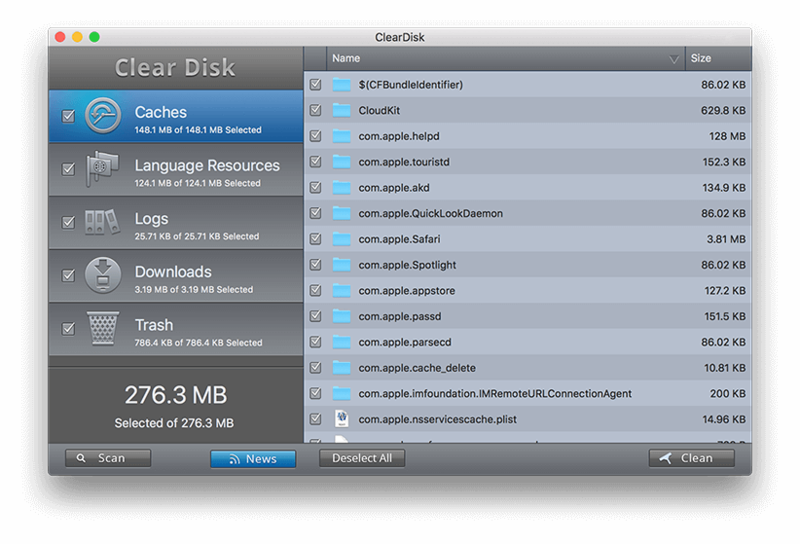 With the Clear Disk Space app, it’s always easy to keep your Mac clean and optimize its performance. 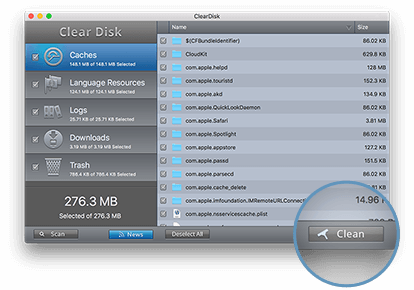 ClearDisk allows you to easily clean up your Mac and quickly free up more space, when your startup disk is full.Do a disk cleanup from time to time and enjoy great performance on your Mac. ClearDisk works quickly and effectively. Clearing cache of all installed apps can be so enjoyable when you can do it in a few seconds. 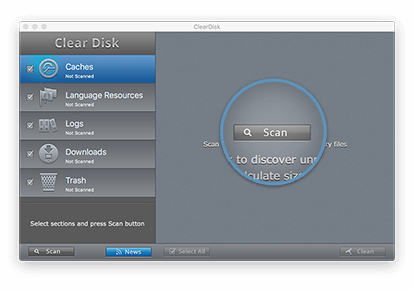 ClearDisk will check how much space is wasted on your startup hard drive and increase the free space available on your primary disk without altering the hardware. ClearDisk discovers the useless files and allows you to remove all unnecessary data really simply. In just a few clicks you’ll have your Mac clean and running the way you would expect. App took no time at all, only a few minutes, to fully scan my computer. It makes it so easy to delete your cache files, which I do once a month, in only one click. Also makes it easy to dump your trash, which saved me almost 2 gbs, when I forget to do it all the time. This is one of those Utility Apps you really can’t live without. Simple, Quick, and Easy. Love it. Well worth the price, and then some. I’ll definitely be getting a lot of mileage out of this app. I’d been looking for something like this for a while and, while I have apps that can do basically the same thing, they don’t do it as elegantly and simply. Or as inexpensively for that matter. Easy 5 star rating; definitely recommend.